Linfield could move above Cliftonville into second in the Premiership table if they beat Dungannon Swifts in Tuesday's rearranged game at Windsor Park. The Blues have won six and drawn one of their last seven league matches but boss David Healy is calling on his side to be "more ruthless" in front of goal. Healy has allowed winger Jonny Frazer to go on loan to Ballymena while Chris Hegarty is being loaned to the Swifts. Carrick Rangers are scheduled to host Glenavon at Taylor's Avenue. Carrick manager Gary Haveron was unhappy with the performance of his players in the 2-0 defeat by Linfield on Saturday and is demanding improvement. "First and foremost I hope the game is on. We have to regroup and stick together," said Haveron, who has signed former Glentoran goalkeeper James Taylor. "Players who haven't been starting will want to come knocking on my door after a display like that," he added. 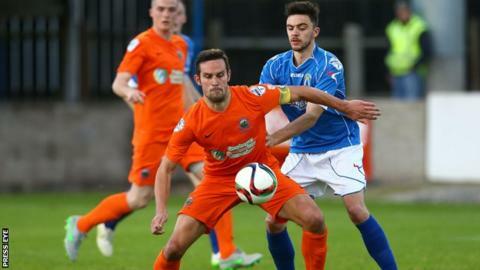 Glenavon's scheduled game against Glentoran on Saturday was called off, as was Dungannon's fixture at home to Warrenpoint. Another Linfield player, TJ Murray, will be loaned to Championship side Dundela.